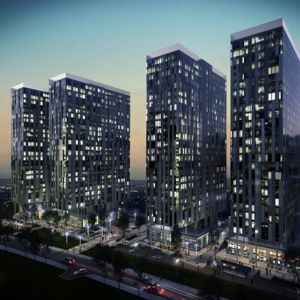 Vermont Capitol is set to start construction work on a £200M residential tower development in Salford Quays in February 2015. The X1 Media City project will consist of four towers housing 1036 apartments and over 22,700 sq ft of commercial space. The residential element of the scheme will comprise of a mix of studios, one, two and three bed apartments. First and second floor space will be available for commercial and retail units, in addition to a private gym and cinema. The scheme will also provide two levels of underground parking. The new development is located in the heart of phase two of MediaCityUK, home of the BBC and ITV television studios. Knight Knox International said the area is thriving thanks to more than £1.4Bn worth of public and private investment in Salford Quays. This investment has seen hundreds of new jobs created in the area. X1 Media City has already been granted planning permission by Salford City Council. The scheme is being developed by Salford based property investment company Knight Knox International, in a joint venture scheme with X1 Developments. Knight Knox International head of marketing Samantha Jones said: “X1 Media City is certain to become an iconic development for Salford Quays and will rival anything located in the city centre. “Investor appetite has grown in line with confidence in the UK buy to let market, and we have seen heightened interest in the local market over the past 18 months. Since launching our first joint venture with X1 Developments back in 2012, we have sold out eight sites and demand for X1 projects is extremely high,” she added.